Saudi Aramco World is a beautiful bi-monthly magazine, produced and distributed for free by the giant Saudi Arab-American oil company (hence Aramco). It has existed for half a century now, and its lavishly illustrated stories, which tend to focus on the Arab and Muslim worlds (with some emphasis on Saudi Arabia), can be accessed for free through its website, which in 2004 received a “Best Magazine Website” award by the Web Marketing Association. Though shorter, it has the look and tone of the National Geographic magazine. I received my copy of the September/October issue some 10 days ago, and you can imagine the look on my face when I opened the package and saw the cover photograph and story title: Arabic in the Sky. 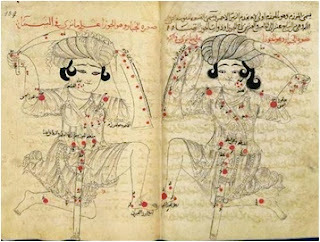 The story, written by Robert W. Lebling, a writer based in Dhahran (Saudi Arabia) and a longtime contributor to Saudi Aramco World, essentially reports on the astronomical history work of Paul Kunitzsch (University of Munich), a world expert on Arabic star names who has done extensive research on their transmission into modern usage. First, Lebling tells us that about 210 stars in the sky (out of the 6,000 or so that can be seen by naked eyes from both hemispheres), have Arabic, or at least Arabicized names. Many of these stars are among the brightest, including Aldebaran (the follower), Algol (the ghoul), Arrakis (the dancer), Betelgeuse (a deformation of yad al jawza’, the hand of the giant), Folmalhaut (the fish’s mouth), Rigel (foot), Thuban (snake), and the (very bright) Summer Triangle: Altair (the flier), Deneb (tail), and Vega (plunging [eagle]). 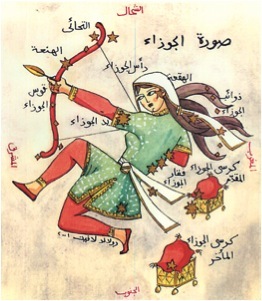 Moreover, all seven stars in the Big Dipper (Ursa Major for astronomers) have Arabian names! Kunitzsch’s research has shown that about 52 % of those names came from what Bedouins saw (imagined) in the sky; others (about 40 %) were from Arabic translations of the names used by Ptolemy, and several are deformations or shortenings of long Arabic names, often done to fit on medieval astrolabes; and finally, many names reflect errors, often gross, in reading and copying manuscripts. 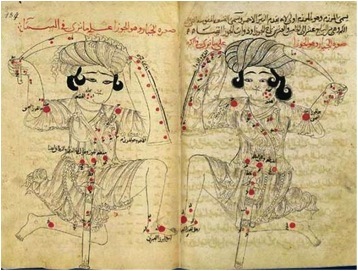 The transmission of Arabic star names to modern astronomical literature, we learn, occurred in three waves. 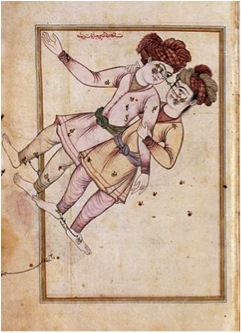 First and foremost, the translation of the major work of Abd Arrahman al-Sufi (903 – 986), a Persian astronomer and one of the most important in the history of Islamic Astronomy, who produced a star catalogue, “the Book of [Constellations of] Fixed Stars” in 964, which not only presented detailed, corrected information on all 48 constellations then recognized as such, but gave superb drawings of each one, some of the most fabulous astronomical illustrations in history. (See below his representations of Orion and of Gemini, the twins; note that as-Sufi’s depiction of Orion ‘the Hunter’ is very similar to the Greek one, which you can see here or here; see below another, unidentified, very interesting – female – version of Orion!) Other works, up to and particularly those of Ulugh Beg (1394 – 1449) at the Samarkand Observatory, are part of the “first wave”. The second wave was carried through by the medieval European translators, particularly Johann Bayer (1572 – 1625), who produced translations of the Arabic version of Ptolemy’s Almagest as well as works from the Islamic Astronomy era (the works of the great Andalusian astronomer az-Zarqali, Ulugh Beg’s star tables, etc.). The third wave of transmission of Arabic star names into modern astronomical literature took place in Europe in the early 19th century, when some 140 names (two thirds of the 210 ones) entered European star charts (particularly through the catalogue of Giuseppe Piazzi, 1746-1826, the discoverer of the first and largest asteroid, Ceres). "... you can imagine the look on my face when I opened the package and saw the cover photograph and story title: Arabic in the Sky." Reminds us once again not to judge a book by its cover. But, Nidhal, it fails me to understand why anyone should show such averse towards such stories? Why can't there be "Arabic in the sky?" If there can be a 'Dipper' or a 'Plough' or a 'Celestial Bureaucrat' or a 'Wagon' or anything else for that matter, why can't there be Arabic? Sorry, but I think my unclear comment led you to misunderstand me. The look on my face was one of total happiness! It's not often that we find a story about astronomy and Arab-Islamic tradition on the cover of such a fine magazine, and for that I was really delighted, even before reading the story (which took some 8 pages!). Of course, there is no reason why there could not be any Arabic in the sky; on the contrary, knowing full well how much Astronomy was held up high and taken to further heights by the Muslims (then), I not only expect but know that Arabic is still written large in the sky (on the brightest stars, as I mentioned). After reading your comment I don't know whether I should cry or whether I should laugh. I decided to not cry and guess what? I had a hearty laugh.